The National Press Club was transformed into an Allied military canteen on Saturdays during World War II. Huge throngs of servicemen soaked up free beer and hot dogs, served by senators, Cabinet members and Pentagon brass, along with the occasional movie star. One Saturday the entire Supreme Court turned out. 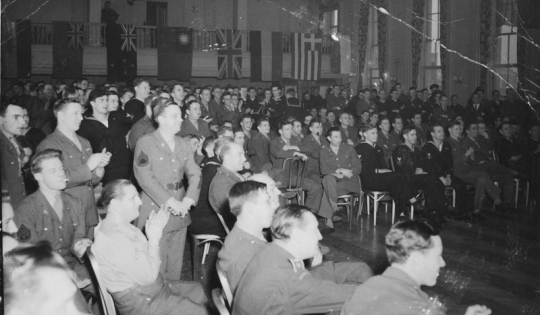 In this photograph taken in 1945, hundreds of G.I.s enjoy a program of entertainment in the Club ballroom. The National Press Club was transformed into an Allied military canteen on Saturdays during World War II. Huge throngs of servicemen soaked up free beer and hot dogs, served by senators, Cabinet members and Pentagon brass, along with the occasional movie star. One Saturday the entire Supreme Court turned out. 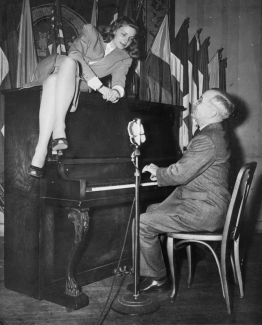 In February 1945, Vice President Harry Truman was famously photographed playing the canteen’s upright piano with starlet Lauren Bacall perched above him. It’s a dubious honor, but some historians credit the National Press Club with a role in launching the Korean War. 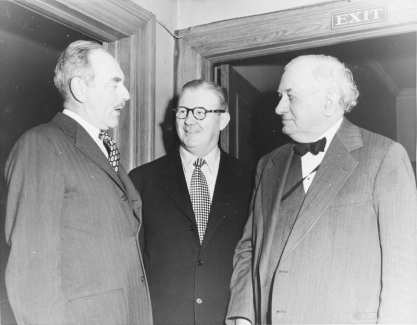 That’s because Secretary of State Dean Acheson (left in photo), in a 1950 address to the Club outlining the American “defense perimeter” in the Far East, made no mention of Korea. That omission may have convinced the Soviet Union to arm North Korea with enough modern weapons to invade South Korea that same year. 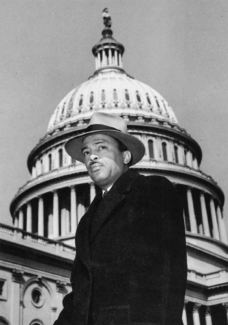 In 1955, Louis Lautier, reporter for The Atlanta Daily World, a black newspaper, broke the National Press Club’s color barrier. Lautier became the first African-American member when the Club voted, 377 to 281, to admit him in an unusual referendum. 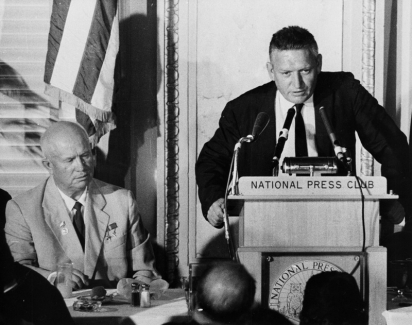 It was the depth of the Cold War when Nikita Khrushchev, the Soviet premier, made an historic tour of America in 1959, starting with the largest news conference in National Press Club history. A special formula was arranged to satisfy Khrushchev’s demand that women journalists ─ then barred from Club membership ─ could attend. In his remarks, the Soviet leader predicted that “new and progressive” Communism would replace “old and moribund” Capitalism. In this photograph, NPC president William H. Lawrence (at the lectern) introduces Premier Khrushchev. Not every word spoken by a newsmaker at the National Press Club has proven to be true. 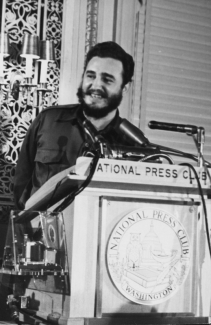 In 1959, a young Fidel Castro addressed a luncheon there, soon after he and his guerilla army had ousted Cuban strongman Fulgencio Batista. Castro insisted he had absolutely no intention of becoming a dictator himself. After that, no high-level Cuban diplomat was allowed back in Washington for 35 years.